An outstanding backs to the wall second half display earned 10-man Motherwell a deserved 0-0 draw against champions Celtic at a freezing Fir Park on Sunday, writes Craig Goldthorp. Referee Craig Thomson controversially showed a straight red card to Motherwell defender Cedric Kipre for kicking out at Celtic's Scott Brown after 41 minutes, but television replays later appeared to show that Kipre hadn't made contact with the Celtic skipper. Brown escaped without being booked, despite the fact that he appeared to provoke Kipre by striking him with his arm as the two were on the ground. This Scottish Premiership clash started with Celtic bossing possession early in the first half, with Olivier Ntcham shooting over the bar. 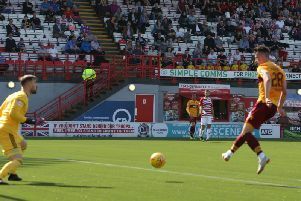 But Motherwell fought their way back and striker Curtis Main had a header saved after Elliott Frear's fine run and cross on the left. And Main came even closer after 25 minutes with a rasping free-kick which Celtic keeper Scott Bain did well to turn round the post. James Forrest then produced a fine run for Celts and unleashed a shot which home keeper Trevor Carson did well to keep out. Chris Cadden had a shot blocked and Richard Tait volleyed a Frear cross well over before the game's major moment of controversy saw Kipre dismissed. Motherwell will surely appeal the decision to send off the big Frenchman. Down to 10 men, the second half of this Scottish Premiership encounter was always likely to be a struggle for Motherwell. And so it proved as Celtic bossed proceedings and missing chances through Forrest, who shot straight at Carson, and Rogic who had an effort saved by Carson after dispossessing Carl McHugh. Moussa Dembele headed over a Rogic cross before Motherwell's doggedness came to the fore as Allan Campbell shot wide after a rare breakaway. McHugh then shot well over after Campbell had won the ball, before Main went down in the penalty area under a challenge but no spot kick was given. Celtic swiftly broke down to the other end but Tait made a brilliant block to stop substitute Scott Sinclair from pinching a victory for the Hoops. A goal at that late stage would have been tough on a Motherwell side who never stopped battling. Team: Carson, Tait, Cadden, McHugh, Main, Frear (Hendrie 76), Bowman, Dunne, Aldred, Kipre, Campbell.